Every Easter I try to come up with a new “look” for my eggs just to make things interesting—and considering how many years I’ve been doing eggs, you can imagine this is quite a challenge. I’ve done bright colors, rainbow colors, hand-painted designs and one year I was so busy that I skipped the dyeing altogether and just put coins inside plastic eggs! The kids liked it, but I can’t say it felt right. 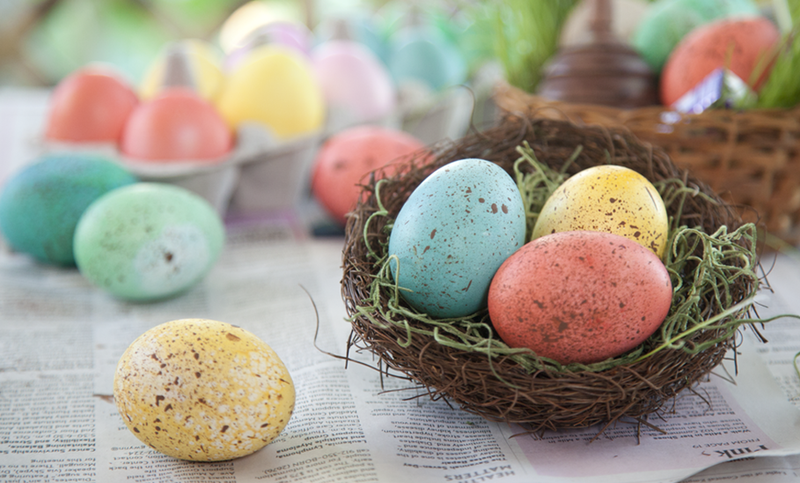 For this Easter’s egg inspiration I turned to the hens and ducks in my own backyard. My feathered friends lay the most beautiful eggs. They are light brown and dappled with darker browns, and the ducks’ eggs, which are a bit larger, can have the prettiest blue tinge to ‘em. Both versions are so unlike the bright white ones you find in the grocery and I think they’re more naturally beautiful because of it. So I decided to try my hand at dyeing eggs in soft pastels and then speckling them with a toothbrush lightly dipped in brown paint. About halfway through the first batch of eggs, in walks Jamie’s wife with my grandson, Matthew. He got so exited when he saw me painting the eggs and of course he wanted to help his “Guinny” out. He loved the rainbow of colors in the jam jars and thought it was just magic when we dipped the eggs in and they turned pretty blues, pinks and yellows. He wasn’t too much able to do the speckling—he was a bit heavy handed with the paint—but I wasn’t much better, so I reserved judgment; his eggs will just be a little harder to find in the garden than the others! Most important, Matthew’s impromptu visit reminded me that Easter is such a special time for kids—and just about the only time they’ll get excited about a silly ol’ egg. It’s not about presents or even the chocolate bunnies so much; we honor the holiday together as a family through these wonderful traditions. When Easter Sunday comes around, I’ll again attend a beautiful sunrise service on Tybee and then join the family for a big egg hunt at the house. We’ll enjoy a traditional brunch together, probably with a delicious spiral ham and a spread of my favorite dishes, and I’ll look down the table at my ever-growing family—my five beautiful grandsons—and appreciate how blessed the Good Lord has made me.